In order to correctly perform a pass, you will need to keep two things in mind: the positioning of your body around the ball and the formation of your foot, leg and ankle. To position your body correctly, you will need to know your kicking foot. This is usually the same side as the hand you write with, but that may not always be the case. For our purposes, let’s use the example of a right-footed kicker. 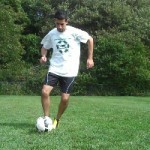 Now that you know your kicking foot, let’s correctly position your body around the ball. 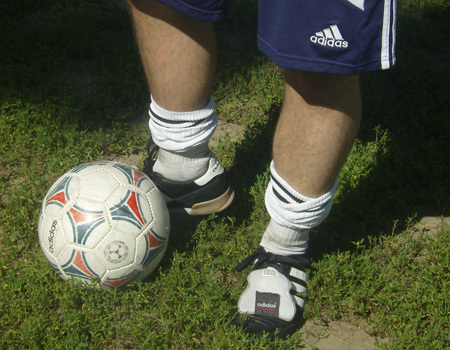 When you approach the ball, your supporting leg (left leg) should step next to the ball, generally about 3 inches away, but this may vary with the size of the player. 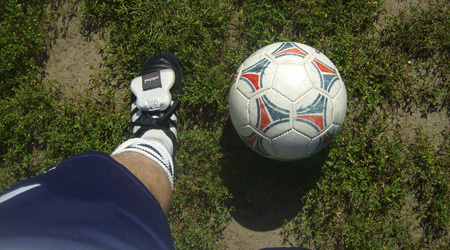 Make sure your foot is planted firmly on the ground, pointing in the direction you want the ball to travel. Your body should then shift weight toward this supporting leg while swinging the kicking leg (right leg) at the ball. Now that you know the general mechanics of the motion, let’s see how to properly align your foot for the pass. 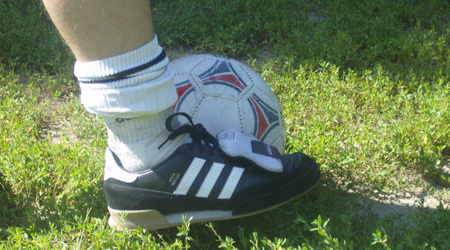 Passes can be made with the outside of the foot, the top of the foot (the laces) and the insole of the foot. We will only look at how to make a pass with the insole. When you are standing in place, your leg and foot should be in a 90 degree angle through your ankle. This is the proper formation of the leg to form a pass. Try to turn your leg so it is facing away from the side of your body that you are kicking from so your feet now make a 90 degree angle with each other. Now you have the proper form for your foot to make a pass. Combine this foot/leg formation with the correct body positioning from above, and now you are making proper passes. 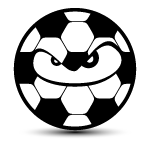 For players who are left-footed, do the opposite of what was discussed above! However, don’t limit yourself to using only one foot. Always practice with both feet. As your skills progress, you will be able to pass with either foot at any given time in the game.